The 2014 Belgian Grand Prix (officially the 2014 Formula 1 Shell Belgian Grand Prix) was the twelfth race of the 2014 Formula One season. It was the 70th Belgian Grand Prix – the 59th as a round of the Formula One World Championship. It was held between August 22 and August 24, 2014. Nico Rosberg took pole position in a wet qualifying session, ahead of teammate Lewis Hamilton. Hamilton made a better start than Rosberg, who also fell behind Sebastian Vettel. Rosberg overtook his fellow German and attacked Hamilton. The teammates touched, leaving Hamilton with a puncture he would not recover from, and leaving Rosberg with a damaged front wing. Daniel Ricciardo took advantage and won the race; Rosberg finished a close second after a late charge. Hamilton retired five laps from the end, which saw Rosberg extend his championship lead to 29 points. After the race, sixth-placed Kevin Magnussen was given a twenty-second time penalty for forcing Fernando Alonso off the road; the penalty meant he fell to twelfth place. André Lotterer made his F1 début at the race, though it was not a success, as he retired early. Two DRS activation zones were used on the circuit. The first was located on the start/finish straight, and the second was on the Kemmel Straight. Before going into the summer break, Lewis Hamilton closed the gap to Nico Rosberg to 11 points after scoring 3rd in Hungary, while in the Constructors' Championship, Mercedes held a massive 174-point lead from Red Bull. Prior to the race, three driver changes were announced. Two were to affect this race, and another to affect 2015. Firstly, André Lotterer signed a one-race deal to replace Kamui Kobayashi at Caterham; secondly, new Marussia reserve driver Alexander Rossi was to be given his début opportunity, replacing Max Chilton due to "contractual issues"; finally, Jean-Éric Vergne was left without a drive for 2015, as Max Verstappen was announced as Toro Rosso's new driver. During Free Practice 1, it was announced by Marussia boss Graeme Lowden that Max Chilton would in fact retain his drive seat for the race. Alexander Rossi took part in FP1, but Chilton returned to the car for FP2 and beyond. The first practice session ran for 90 minutes on Friday. The fastest lap was set by Rosberg, who was followed by Hamilton and Alonso, though Hamilton missed a few braking points, went wide twice at Pouhon and had a slight wobble while driving through Eau Rouge. Alonso also lifted off the track and stopped ahead of Eau Rouge, due to feeling something on his engine so to check if he was okay to bring it back on, before coming back to the pits for the team to work on his car. Marcus Ericsson had a spin at La Source, but managed to continue with not much fuss. Kimi Räikkönen also spun at the corner, having concerned that there were temperature problems, but later came back on the track when Ferrari informed that his car was okay. Vettel could only handle 11 laps without any problems before he suffered an electrical issue, and also went wide at Pouhon. His team had to make a change on his car's power unit. The second practice session took part on the same day as the first session, and also lasted 90 minutes. This time, Hamilton took the fastest time, followed by teammate Rosberg, Alonso and Felipe Massa, though Rosberg ran a bit wide onto the kerb when exiting Les Combes. The session was red-flagged twice when Pastor Maldonado spun and hit the barriers near Pouhon when his right tyres were put on the grass, and Esteban Gutiérrez spun off at Blanchimont, blaming a problem with his gearbox. Vettel was unable to compete, due to the Red Bull team having to change his engine after receiving a failure in his car's hybrid system in the first session. The third and final practice session ran for an hour, and took place on Saturday. Valtteri Bottas set the fastest lap ahead of Ricciardo, Rosberg, Räikkönen and Hamilton. Sauber-Ferrari 1:54.335 17 DNP 24 ! DNP 24 ! Marussia-Ferrari 1:57.232 20 DNP 25 ! DNP 25 ! The first qualifying session ran for 18 minutes. Any driver who qualified 17th or lower was eliminated. The 107% rule was used in the session, where the drivers had to set a time within the fastest time so to compete in the race. There was a heavy rainfall and hailstorm before the session started, but the clouds cleared in time for the first session. Rosberg set the fastest time, being 2:07.130. Hamilton came second, with a time of 2:07.280. While setting his first fastest lap, Hamilton went off the Bus Stop chicane, but it didn't affect him getting to the top of the results. Maldonado was unable to improve his time of 2:11.261 when he spun at the same chicane, qualifying 17th. Gutiérrez had to pull over at Campus after his car received a technical problem, and qualified 20th. Other drivers eliminated were Nico Hülkenberg, Max Chilton, André Lotterer and Marcus Ericsson. Q2 lasted for 15 minutes, and eliminated the drivers who qualified 11th to 16th. The rain came in again for the second session. Despite having a few wobbles and going wide a few times, Hamilton and Rosberg came first and second respectively. Romain Grosjean spun at La Source in the middle of the session, and qualified 15th. Daniil Kvyat, Jean-Éric Vergne, Sergio Pérez, Adrian Sutil and Jules Bianchi were the other drivers eliminated. The final qualifying session ran for 12 minutes, and chose the top ten positions. The rain stopped before the session started. Rosberg set pole position, with a time of 2:05.591. It was his first pole position at the Circuit de Spa-Francorchamps. Hamilton came second after making mistakes on all of his flying laps, including going wide at La Source, which he stated that he was struggling on the brakes. The race began at 14:00 local time (UTC+1), with the conditions being dry. Fernando Alonso's car stalled on the grid at the start of the formation lap as the Ferrari team struggled on it. He was eventually able to get going and keep his grid position. Lewis Hamilton took the lead from Nico Rosberg before reaching La Source. Rosberg also fell behind Sebastian Vettel. Romain Grosjean made contact with Jules Bianchi before reaching Eau Rouge, puncturing Bianchi's right rear tyre. On the Kemmel Straight, Vettel tried to take the lead from Hamilton like in 2013, but went wide at Les Combes, and got back on the track in third place. Lap 2 became a controversial moment when Rosberg made contact with Hamilton at Les Combes, damaging Rosberg's front wing as well as puncturing Hamilton's left rear tyre. Hamilton went on to say calmly on the team radio, "Nico hit me. Nico's hit me." This was later classified as Rosberg's fault by Mercedes. Pastor Maldonado and André Lotterer were forced to retire when their cars both came to a stop, due to problems with their engines. Meanwhile, Alonso was given a five-second penalty due to the Ferrari mechanics not returning to the pits within 15 seconds during the formation lap, and was later overtaken by Daniel Ricciardo. After his first pit stop, Hamilton came back out in 19th place, but the debris from his tyre heavily damaged his car's floor. Felipe Massa was also affected, as part of the debris got stuck on his car's floor, costing him around two seconds. Ricciardo got into second place after Vettel went wide at Pouhon. Sergio Pérez, meanwhile, was able to get past Massa for ninth place. On lap 8, Valtteri Bottas got into fourth place by using DRS to overtake Alonso on the Kemmel Straight. Rosberg came into the pits at the end of the lap, putting on medium tyres and having his front wing changed. Kimi Räikkönen came in for a pit stop as well, and Rosberg came back on the track in 15th behind him, which the lead was taken by Ricciardo. Pérez and Massa took pit stops at the end of the next lap, though the Williams team did not remove the debris on Massa's car floor. On lap 10, while driving along the Kemmel Straight, Rosberg's radio aerial caught a piece of debris coming off Esteban Gutiérrez's car, believed to be from Hamilton's tyre. Vettel, meanwhile, came in for a pit stop, rejoining behind Räikkönen. On lap 11, Ricciardo came into the pits, putting on more soft tyres, and joined again in fourth, putting Bottas into the lead. Hamilton was in 17th place, and was catching up to Grosjean. Bottas and Alonso later took their first pit stops, with Alonso serving his five-second penalty. Alonso was able to get past Pérez at Rivage to get into seventh place. Jenson Button took the lead for the whole lap before taking his first pit stop, putting Ricciardo back in first place. Hamilton, meanwhile, managed to get past Grosjean into 16th place. On lap 15, Kevin Magnussen overtook Jean-Éric Vergne at the Bus Stop chicane, before he later picked off Alonso. Meanwhile, the debris on Rosberg's radio aerial was shed off. By lap 17, Rosberg tried to get past Vettel for third place, but locked up going into the Bus Stop chicane, and was overtaken by Bottas on the Kemmel Straight. Hamilton came in for his second pit stop, where the team put on medium tyres along with a tweak to his car. The stewards decided to classify the two Mercedes drivers' collision as a racing incident. Rosberg later reported to the Mercedes team that his front tyre was vibrating, and took his second pit stop on lap 20 to put on more medium tyres before coming back on the track in 11th place. Massa came into the pits a second time on lap 21, and this time, the team saw the tyre debris and removed it, meaning that he had previously lost around 40 seconds in total, before going nearly three seconds quicker. Hamilton, who was in 17th place, wasn't able to get into the points, and asked his race engineer: "Guys, should we save the engine?" The reply was: "We are looking at the options now and we will come back to you, but your pace is good." Rosberg set a new fastest lap on lap 22, and took seventh place from Pérez. He did the same on Button during lap 23, only for Button to take sixth place back. Vettel, meanwhile, headed into the pits for medium tyres, and came back out in eighth place. Räikkönen later came into the pits from second place. Rosberg managed to overtake Alonso on the next lap, though he told his team on the radio: "Just ask Charlie if that pass was ok." Alonso later went for his next pit stop to put on medium tyres, rejoining in ninth place. His teammate Räikkönen was able to get past Button into fourth place. Ricciardo gave the lead to Bottas when he took his second pit stop on lap 28, putting on medium tyres and rejoining the track in fifth. Hamilton, meanwhile, was in 16th place and trying to catch up to Adrian Sutil, and told his team on the radio: "I don't know how I am going to catch the guys in front." His race engineer replied: "If there's a safety car it's still all to play for - just keep plugging away." Ricciardo regained the lead when Bottas headed in for his next pit stop on the next lap. Hamilton was still not in the top ten, telling the team: "I have absolutely no downforce." His engineer then gave the reply: "We hear you Lewis but you do have good pace and if there is a safety car it would put you back in there, we are not concerned about the engine so hang in there." Bottas had a look at Vettel, and overtook for fourth place at Les Combes. Hamilton took his third pit stop on lap 31 to take medium tyres, and came back on the track in 16th place behind Gutiérrez. Grosjean had to retire, coming into the pit garage on lap 33. Rosberg took another pit stop, being given soft tyres, and resumed in fourth place. However, he got overtook by Bottas, but managed to take the place back and get past Räikkönen to take second place. Still not getting into the points, Hamilton pleaded to save his engine, but his race engineer told him that the team was not concerned. Eventually, the team told Hamilton to pit so to cool his car, to which he exited the race on lap 39. Räikkönen's hopes for his first podium of 2014 were over when he was overtook by Bottas along the Kemmel Straight. Receiving a problem with his gearbox, Bianchi had to retire on lap 41. By lap 42, Button and Alonso traded places, before Vettel overtook Button to get into seventh, as Max Chilton and Marcus Ericsson battled for 16th place. Rosberg, meanwhile, was about eight seconds behind Ricciardo. Alonso tried to overtake around the outside of Magnussen on lap 43, but got pushed onto the grass, allowing Vettel to get into fifth place. Ricciardo won the race 3.3 seconds ahead of Rosberg, with Bottas finishing third. The top three drivers collected the trophies during the podium ceremony, and were all interviewed by Eddie Jordan before they came to the subsequent press conference. Rosberg, however, was booed by the crowd for his incident with Hamilton. With the results from the race, Rosberg led the Drivers' Championship with 220 points. Because he failed to score any points, Hamilton remained second with 191 points. After taking victory, Ricciardo was third with 156 points, ahead of Alonso with 121. Bottas' third place finish took him up to 110 points. Mercedes continued leading the Constructors' Championship with 411 points, ahead of Red Bull with 254 points. Ferrari remained third in the championship with 160 points. Following the race, Rosberg was accused by Hamilton for crashing into him; Hamilton explained: "He said he did it on purpose, he said he could have avoided it. He said 'I did it to prove a point.'" However, Rosberg denied that he tried to make any wrongdoing, stating that "I gave it a go. I didn't see any risk in trying to overtake, so why should I not try?" Toto Wolff, the executive director of Mercedes, also said: "We had a collision that could have been avoided, a second-lap collision. It was Nico who attacked and he shouldn't have done it." At the time, it was as if the team had let Hamilton and Rosberg's rivalry grow out of control, after Rosberg's controversial qualifying incident in Monaco. Magnussen dropped from sixth to 12th when he was given a 20-second time penalty and two penalty points for forcing Alonso off the track. * Kevin Magnussen (originally sixth) was given a twenty-second time penalty for forcing Fernando Alonso off the track. ↑ "2014 Formula 1 Shell Belgian Grand Prix". Formula One World Championship Limited. Archived from the original on 24 March 2015. http://web.archive.org/web/20150108012818/http://www.formula1.com/races/in_detail/belgium_927/circuit_diagram.html. Retrieved 28 January 2015. ↑ "World Motor Sports Council". FIA. 4 December 2013. http://www.fia.com/news/world-motor-sport-council-3. Retrieved 28 January 2015. ↑ 3.0 3.1 McEvoy, Jonathan (24 August 2014). "Daniel Ricciardo wins Belgian Grand Prix as Lewis Hamilton is forced to retire after collision with team-mate Nico Rosberg". Daily Mail (DMG Media). http://www.dailymail.co.uk/sport/formulaone/article-2733116/Daniel-Ricciardo-wins-Belgian-Grand-Prix-Lewis-Hamilton-forced-retire-collision-team-mate-Nico-Rosberg.html. Retrieved 28 January 2015. ↑ 4.0 4.1 "Belgian Grand Prix – Preview 2014". FIA.com. Fédération Internationale de l'Automobile. 20 August 2014. http://www.fia.com/news/belgian-grand-prix-preview-2014. Retrieved 28 January 2015. ↑ "Andre Lotterer replaces Kamui Kobayashi at Caterham F1 team". Autosport. Haymarket Publications. 20 August 2014. http://www.autosport.com/news/report.php/id/115449. Retrieved 28 January 2015. ↑ "Rossi to replace Chilton at Marussia for Spa weekend". Formula1.com. Formula One Management. 21 August 2014. Archived from the original on 24 March 2015. http://web.archive.org/web/20141209145404/http://www.formula1.com/news/headlines/2014/8/16224.html. Retrieved 28 January 2015. ↑ "Verstappen to race for Toro Rosso in 2015". GPUpdate.net. 18 August 2014. http://www.gpupdate.net/en/f1-news/314888/verstappen-to-race-for-toro-rosso-in-2015/. Retrieved 12 January 2015. ↑ "Verstappen to race for Toro Rosso in car number 33". Twitter.com. 12 December 2014. https://twitter.com/maxverstappen3/status/543446709305901056/. Retrieved 28 January 2015. ↑ Galloway, James (22 August 2014). "Max Chilton to race in Belgian GP after all as Marussia U-turn on Alex Rossi decision". Sky Sports F1. BSkyB. http://www1.skysports.com/f1/news/17581/9432885/max-chilton-replaced-by-alexander-rossi-at-marussia-for-the-belgian-gp. Retrieved 28 January 2015. ↑ 10.0 10.1 10.2 10.3 10.4 10.5 "2014 Formula One Sporting Regulations". FIA.com. Fédération Internationale de l'Automobile. 12 March 2014. http://www.fia.com/sites/default/files/regulation/file/1-2014%20SPORTING%20REGULATIONS%202014-02-28.pdf. Retrieved 19 January 2015. ↑ Codling, Stuart (22 August 2014). "Belgian GP: Nico Rosberg quickest in opening practice session". Autosport. Haymarket Publishing. http://www.autosport.com/news/report.php/id/115482. Retrieved 29 January 2015. ↑ Benson, Andrew (22 August 2014). "Belgian GP: Rosberg edges Hamilton in Spa first practice". BBC Sport. British Broadcasting Corporation. http://www.bbc.co.uk/sport/0/formula1/28896572. Retrieved 29 January 2015. ↑ "Belgian Grand Prix - practice as it happened". BBC Sport. British Broadcasting Corporation. 22 August 2014. Archived from the original on 22 April 2015. http://www.bbc.co.uk/sport/0/formula1/28881163. Retrieved 29 January 2015. ↑ Benson, Andrew (22 August 2014). "Belgian GP: Hamilton dominant in second practice at Spa". BBC Sport. British Broadcasting Corporation. http://www.bbc.co.uk/sport/0/formula1/28901447. Retrieved 29 January 2015. ↑ Benson, Andrew (23 August 2014). "Lewis Hamilton fifth as Valtteri Bottas quickest in final practice". BBC Sport. British Broadcasting Corporation. http://www.bbc.co.uk/sport/0/formula1/28911116. Retrieved 29 January 2015. ↑ 16.0 16.1 16.2 "Belgian GP qualifying as it happened". BBC Sport. British Broadcasting Corporation. 23 August 2014. Archived from the original on 22 April 2015. http://www.bbc.co.uk/sport/0/formula1/28902640. Retrieved 30 January 2015. ↑ Benson, Andrew (23 August 2014). "Lewis Hamilton beaten to pole by Nico Rosberg at Belgian GP". BBC Sport. British Broadcasting Corporation. http://www.bbc.co.uk/sport/0/formula1/28912696. Retrieved 30 January 2015. ↑ "Belgian Grand Prix 2014 Qualifying Results". formula1.com. 23 August 2014. Archived from the original on 24 March 2015. http://web.archive.org/web/20150217172640/http://www.formula1.com/results/season/2014/927/7382/. Retrieved 30 January 2015. ↑ 19.00 19.01 19.02 19.03 19.04 19.05 19.06 19.07 19.08 19.09 19.10 19.11 19.12 19.13 19.14 19.15 19.16 19.17 19.18 19.19 "Belgian Grand Prix as it happened". BBC Sport. British Broadcasting Corporation. 24 August 2014. Archived from the original on 22 April 2015. http://www.bbc.co.uk/sport/0/formula1/28913247. Retrieved 30 January 2015. ↑ 20.0 20.1 20.2 20.3 20.4 20.5 20.6 20.7 Beer, Matt; van Leeuwen, Andrew; Anderson, Ben; Cross, Dan (24 August 2014). "As it happened: Sunday - Belgian Grand Prix". Autosport. Haymarket Publications. http://live.autosport.com/commentary.php/id/772. Retrieved 30 January 2015. ↑ Johnson, Daniel (24 August 2014). "Lewis Hamilton says Mercedes team-mate Nico Rosberg crashed into him on purpose in Belgian Grand Prix". The Daily Telegraph (Telegraph Media Group). http://www.telegraph.co.uk/sport/motorsport/formulaone/11054124/Lewis-Hamilton-says-Mercedes-team-mate-Nico-Rosberg-crashed-into-him-on-purpose-in-Belgian-Grand-Prix.html. Retrieved 30 January 2015. ↑ Benson, Andrew (23 November 2014). "Lewis Hamilton & Nico Rosberg: 'They'd even race eating pizza'". BBC Sport. British Broadcasting Corporation. http://www.bbc.co.uk/sport/0/formula1/30009435. Retrieved 24 March 2015. ↑ Richards, Giles (24 August 2014). "Daniel Ricciardo wins F1's Belgian GP as Hamilton-Rosberg spat reignites". The Guardian (Guardian Media Group). http://www.theguardian.com/sport/2014/aug/24/daniel-ricciardo-lewis-hamilton-nico-rosberg-grand-prix. Retrieved 30 January 2015. ↑ 24.0 24.1 24.2 Pickup, Oliver (24 August 2014). "Belgian Grand Prix 2014: as it happened". The Daily Telegraph (Telegraph Media Group). http://www.telegraph.co.uk/sport/motorsport/formulaone/11053656/Belgian-Grand-Prix-2014-as-it-happened.html. Retrieved 31 January 2015. ↑ 25.0 25.1 25.2 "Who said what after the Belgian GP". ESPN Sport UK. 24 August 2014. http://www.espn.co.uk/belgium/motorsport/story/172491.html. Retrieved 31 January 2015. ↑ 26.0 26.1 Anderson, Ben (24 August 2014). "Belgian GP: Massa says Hamilton tyre debris spoilt his Spa race". Autosport. Haymarket Publications. http://www.autosport.com/news/report.php/id/115559. Retrieved 31 January 2015. ↑ Johnson, Daniel (24 August 2014). "Belgian Grand Prix 2014: Clash between Lewis Hamilton and Nico Rosberg eclipses victory for Daniel Ricciardo". The Daily Telegraph (Telegraph Media Group). http://www.telegraph.co.uk/sport/motorsport/formulaone/11053773/Belgian-Grand-Prix-2014-Clash-between-Lewis-Hamilton-and-Nico-Rosberg-eclipses-victory-for-Daniel-Ricciardo.html. Retrieved 31 January 2015. ↑ "2014 Belgian Grand Prix Race Press Conference". FIA. 24 August 2014. http://www.fia.com/news/2014-belgian-grand-prix-race-press-conference. Retrieved 1 February 2015. ↑ 29.0 29.1 29.2 Collantine, Keith (24 August 2014). 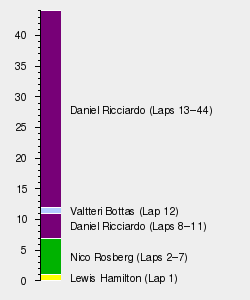 "2014 Belgian Grand Prix championship points". F1 Fanatic (Keith Collantine). http://www.f1fanatic.co.uk/2014/08/24/2014-belgian-grand-prix-championship-points/. Retrieved 1 February 2015. ↑ Richards, Giles (24 August 2014). "Lewis Hamilton claims Nico Rosberg deliberately crashed into him at Spa". The Guardian (Guardian Media Group). http://www.theguardian.com/sport/2014/aug/24/lewis-hamilton-nico-rosberg-deliberate-crash-spa-f1-belgian-grand-prix. Retrieved 1 February 2015. ↑ "Rosberg keeps Monaco pole following Stewards' investigation". FIA. 24 May 2014. http://www.fia.com/news/rosberg-keeps-monaco-pole-following-stewards-investigation. Retrieved 1 February 2015. ↑ Collantine, Keith (24 August 2014). "Magnussen drops from sixth to twelfth after penalty". F1 Fanatic (Keith Collantine). http://www.f1fanatic.co.uk/2014/08/24/magnussen-drops-sixth-twelfth-penalty/. Retrieved 1 February 2015. ↑ 33.0 33.1 "Belgian Grand Prix 2014 Race Results". formula1.com. 24 August 2014. Archived from the original on 24 March 2015. https://www.formula1.com/content/fom-website/en/championship/results/2014-race-results/2014-belgium-results.html. Retrieved 1 February 2015. ↑ "Belgian Grand Prix – Race". eurosport.yahoo.com. 24 August 2014. https://uk.eurosport.yahoo.com/formula-1/belgian-grand-prix/2014/race.html. Retrieved 1 February 2015.